Last Year: 16th with a 6-18 (-243) record for 16 points. Parramatta have restocked the front office and the arrival of Ricky Stuart has been a boon for their membership numbers... but the squad that 'won' the Wooden Spoon last year is pretty much the same unit that will take the field in 2013... so just how much magic can Stuart conjure with one pre-season and the same talent level that delivered just six wins a year ago? Darcy Lussick is likely to move up front at Parramatta permanently and forms a solid prop rotation with Tim Mannah, FuiFui MoiMoi and the under-rated Mitchell Allgood. The club will also be hoping Willie Tonga plays like the highly paid centre he appears as on their salary cap and of course they need more - much more - from Chris Sandow and Jarryd Hayne than they got in 2012. John FOLAU, Frazer MASINAMUA, Pauli PAULI, Kaysa PRITCHARD, Kelepi TANGINOA, Joseph UALESI. Expect Blair and Morgan to be in the starting three-quarter line ahead of Loko and Mullaney, the backrow could also be any combination of four or five forwards. PAR: Hayne, Blair, Tonga, Morgan, Sio, Kelly, Sandow, Lussick, Keating, Mannah, Paulo, Smith, Maitua. Bench: Ryan, Roberts, Allgood, MoiMoi. Semi Radradra and Vai Toutai look a few rungs behind on the three-quarter depth chart but their chance will only come if Jacob Loko isn't fit enough to get first crack. All three have plenty of ability.Then there is a massive amount of young talent in the forwards... you'll know who they are if they get a chance - but Parra's greatest area of depth is up front, so don't expect too many newbies in the pack this year. Dim... and that's being generous. 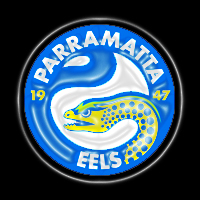 Defensively they must get better when the game goes against them, but if the Eels can't create scoring opportunities (they did show some signs late in 2012 under Brad Arthur and that was without Hayne fit) teams will simply beat them 18-6 every week. If they want to keep their fans interested in their playoff chances - they have to win half of their first 8 games... vWAR vCBY @WTG @SYD vCRO @GLD @PEN vNQL - is a 4-4 split realistic Parra fans? 16th | The Wooden Spoon is theirs to lose unless there's a drastic improvement... and quickly. 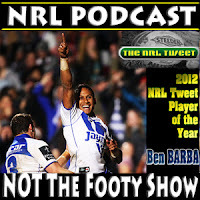 Can Jarryd Hayne or Chris Sandow take Ben Barba's mantle as the game's best player in the 2013 @NRLTweet Player of the Year Awards?